The VECTORR technology is as green as any transportation system operating today. It minimizes visual, noise, air, and earth pollution. The elevated guideway reduces the environmental impact to the land with minimal earth moving and fewer tunnels while transporting passengers safely above pedestrian, vehicle, and wildlife grade crossings. This page contains a summary of the some of our technology. If you are interested in a greater level of detail, please download the VECTORR Technical Overview, a five page document. ​The patented VECTORR atmospheric transportation system uses vacuum and air pressure (differential pressure) to move the train. Stationary power systems create a vacuum in a tube located below the rails on the guideway. Inside the power tube is a free piston that runs laterally on its own rails. The VECTORR is magnetically coupled to this free piston through the wall of the power tube. As the stationary power system pulls the air from the tube, it creates a vacuum in front of the free piston and compressed air up to 15 psi behind the free piston. This creates the differential pressure that moves VECTORR. It is important to note that VECTORR is completely unlike Maglev technology. Instead of levitating the system, VECTOR depends on magnets for coupling the thrust valve/free piston from within the power tube to the VECTORR unit. 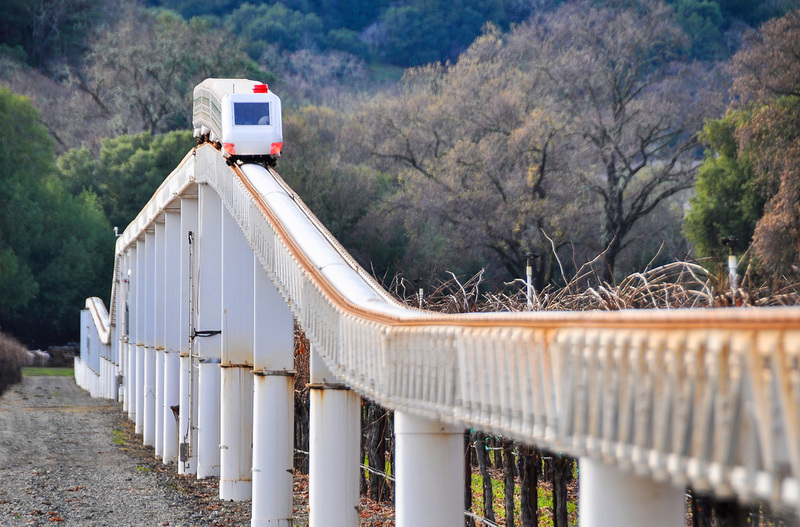 ​VECTORR operates on an elevated guideway. The elevated guideway eliminates grade crossings which allows a safer environment for passengers, pedestrians, maintenance workers, and vehicles while allowing the unit to run at constant speeds for longer stretches. This guideway also lessens the environmental impact. Because VECTORR does not depend on traction, the elevated guideway can be built with grades up to 10% and greater. 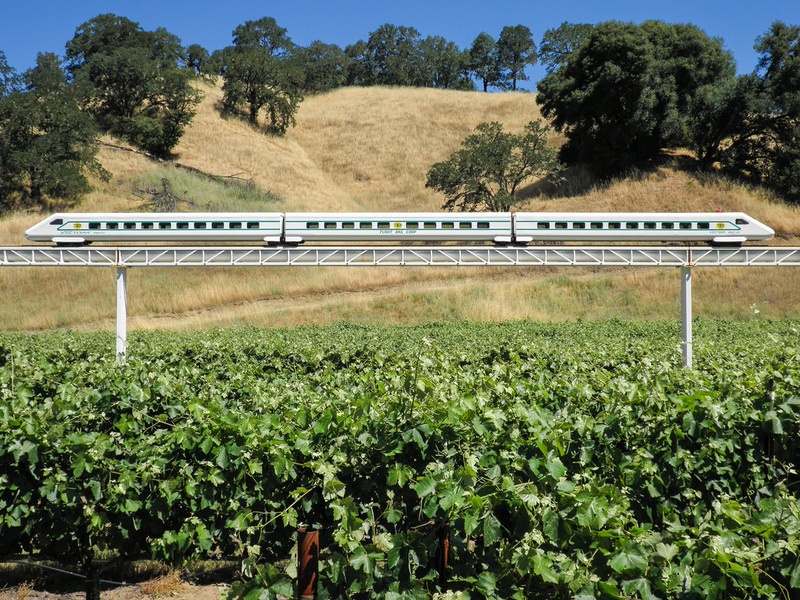 With this grade-climbing capability, VECTORR will require fewer tunnels than some of the other high-speed conventional systems. VECTORR could be built within or adjacent to interstate right-of-ways as it can negotiate grades as steep as those normally found on the interstate highway system. ​The VECTORR is light weight because there is no on-board propulsion system or fuel. The stationary power systems eliminate the need for traction motors, locomotive, or other prime moving equipment attached to the system for propulsion. Depending on the terrain and the power needs of VECTORR these power systems can be located up to 50 miles (80.5 km) apart along the guideway and powered with electric motors or other power sources. Due to stored energy capability in the power tube, rapid starting acceleration can be accomplished without the occurrence of high energy spikes. 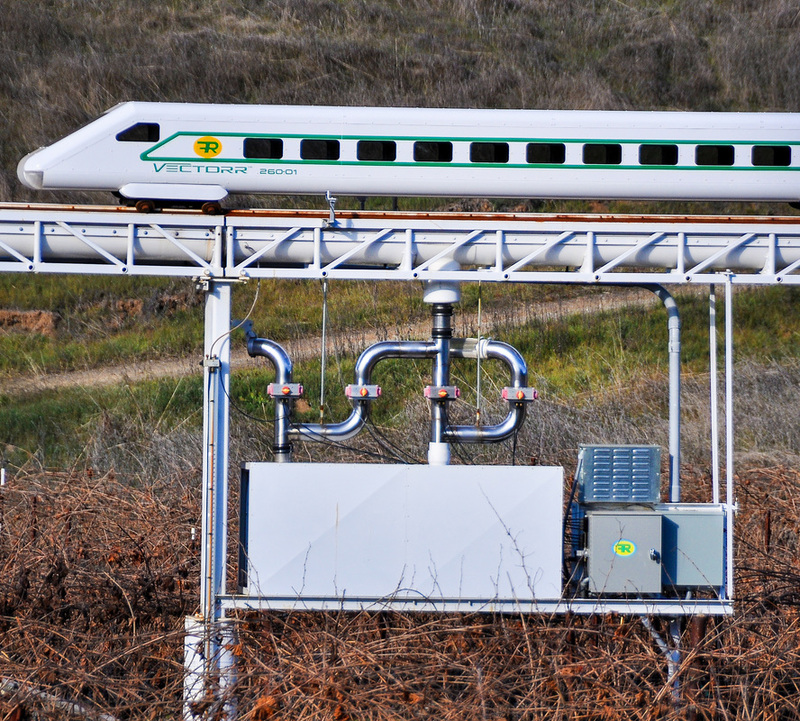 With our prototype, two stationary power systems are installed to move the VECTORR along the guideway. The pilot model currently operates at speeds up to 30 mph (48.30 km/h) which equates to a scale speed of 180 mph (290 km/h). The power systems can employ scrubbers and filters that cannot be incorporated on moving systems. A full-size VECTORR is designed to accommodate between 240 and 800 passengers. The number of passengers depends on the number of passenger modules comprising the VECTORR unit. A VECTORR unit can be up to ten modules long. Each module is 80 feet (24 m) long and accommodates 80 people. If necessary, wider modules can be utilized to increase the passenger capacity. 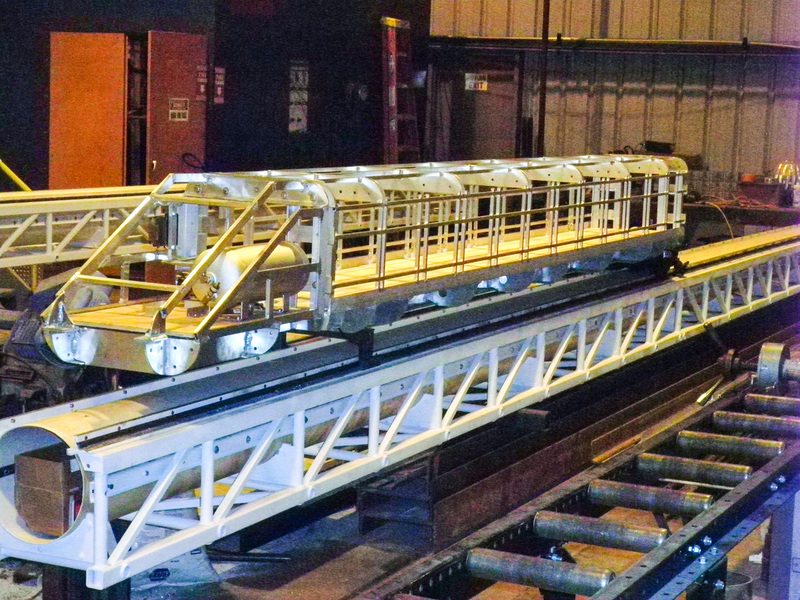 The prototype system pilot test guideway is 2,095 feet (638 m) long and includes all components of a working system. VECTORR 260-01 is the 1/6 scale pilot model currently operating on the guideway. The VECTORR 260-01 unit consists of three modules for a coupled length of 46 feet (14 m) connected by common trucks. The unit weighs about 2,200 pounds. ​Since the VECTORR is moved by differential pressure in the power tube -- not traction -- our overall braking requirements differ from conventional trains. We presently do no wheel braking on our 1/6 scale pilot model. We accomplish braking with a rail braking system and by modulating pressure or vacuum in the power tube. Under emergency conditions the brakes will apply on power or air failure. Our testing has shown that we can use atmospheric braking to stop and reverse the unit or hold the unit on 6% and 10% grades without using contact-type brakes. : The elevated guideway reduces environmental impact because its installation requires less earth moving, trenching, and tunneling. The design of the elevated guideway results in a small on-ground footprint with minimal surface area being impaired. The VECTORR system minimizes roadblocks to people, wildlife, and nature. 2. Energy Efficiency: VECTORR is lightweight and would normally use electric power. A combination of vacuum and air pressure is ultimately moving the unit which is an efficient way to transmit energy. : The CO2 emissions are minimal as the system would normally utilize electricity for propulsion and power for the interior of the module. The source of the electricity or other power producing systems will determine the exact savings of CO2 emissions. 4. Decreased Noise: Without the use of a catenary system or pantographs on VECTORR we eliminate the aerodynamic and frictional noise created by that system. Without the use of a locomotive, we also eliminate the noise created by that power conversion system. VECTORR would be designed to lessen noise from air movement, and the lightweight features can also reduce noise levels. Lubrication of the wheel and rail interface will result in less rolling resistance and will lower noise pollution. Placing a noise barrier adjacent to the rails will also reduce wheel noise. : With no catenary system there are minimal visual distractions to the passengers. The VECTORR does not require the construction of heavy viaducts. The lightweight factor makes it easier to elevate on trusses that can be less visually obtrusive to those driving or living near the guideway.